The Seat of the Naaru’s soaring energies inspired inner peace from the most bloodthirsty of warrior pilgrims, awe from even the most jaded of Azeroth’s inhabitants. The figure floating before the Seat had long taken comfort from this column of Light. Velen looked out from his meditation chamber, seeking insight… in all the connections, great and small, where he might perceive the lines of the future. For the past several months, those lines had increasingly felt fragmented. As the Prophet of the draenei meditated—his legs crossed beneath him, his hands resting on his ancient knees—the crystals that reflected his energies glowed and pulsed and swirled around him, not in patterns but in chaos. And the visions, the endless possibilities of tomorrows, assaulted him. A weary, bedraggled gnome pulled a strange contraption through the dusts of Outland, leaving twin ruts that snaked endlessly in the dunes behind her. Ethereals, their energies wrapped in cloth, simply watched her struggle, neither helping nor impeding the gnome’s hard-fought progress. Vindicator Maraad battled an unseen foe with his gargantuan crystalline hammer and then fell to his knees, a lance of blackest darkness thrust through his chest, oily, diseased smoke trailing the weapon’s edge. The sky-filling, armored form of Deathwing flew across a burned world and landed on a charred, broken tree so vast it could only be Nordrassil, while supplicants draped in dark-purple robes lined up and threw themselves into a volcanic crack in the earth. Med’an—the Guardian of Tirisfal—wept, the tears out of place on his orc-tinged features, his eyes so vulnerable and hurt that the sight of them would have broken the heart of any other. The Prophet had long ago learned detachment from his visions lest they drive him mad. The third eye of prophecy had been with him so long that having premonitions was like breathing. The ata’mal crystal shards had transformed him into a sentinel of alternate universes without end, sometimes down to their very eclipses in darkness, or ice, or fire. Velen didn’t sorrow for these futures or mourn their extinctions or shout in exaltation at their triumphs. He merely read them, watched their woven tapestries, looking for the roads that led to ultimate triumph, where life and the Light battled back the dark and saved everything from annihilation. 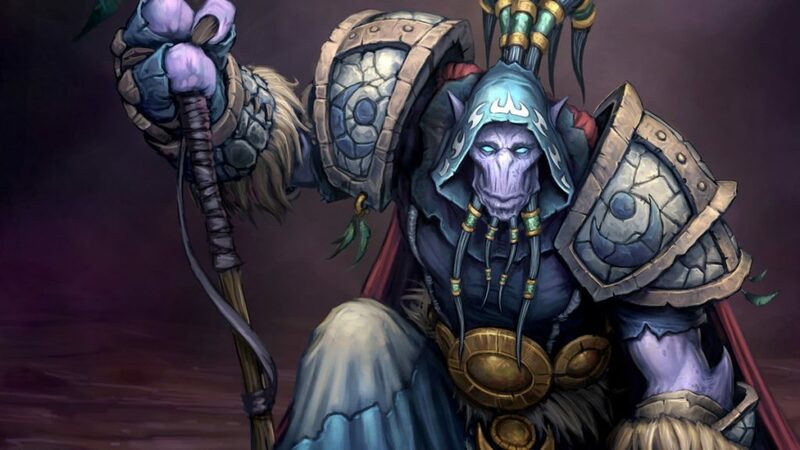 What mattered the minor events prized by most mortals—even his own draenei—measured against the awesome responsibility of ensuring the survival of creation? Velen searched among the debris of the rapidly moving images, trying to seize onto something, find a marker for the path. But it eluded him. Anduin Wrynn knelt in the soft earth, his hands resting on a lasher, one of the few remaining mutations resulting from the Exodar‘s crash on Azeroth. Two draenei flanked the creature, restraining it for the prince, their gentle might keeping it from wriggling free and fleeing the channeled Light in the young boy’s hands. The draenei had once made it their mission to mend the damage their destructive appearance in the world had wrought, but when the majority of the work had been completed, they’d found their powers were needed elsewhere—first in the war against the Burning Legion, then in the march on the Lich King’s icy domain, and now… in the aftermath of the Cataclysm. Some of the twisted monstrosities had been overlooked in the confusion, tragically wandering in madness and pain, diverted from their original purpose by a terrible accident. The first time Anduin had glimpsed one, he’d felt not disgust but sorrow. I have to help. I have to try. At the first break in his lessons with Velen, the prince had raced off into the wilds of Azuremyst Isle, his draenei escorts rushing in his wake. Now they served as crude bonds while he beseeched the Light to heal the mutant, to calm its madness. Anduin didn’t understand what was wrong with the thing. He didn’t need to. The Light knew. Its power moved through the young prince, using him as its channel to set aright the creature writhing under his hands. The act of healing always made Anduin feel like the key in a lock, the tool applied to its proper use, and he’d proven his talents to himself in his time with the draenei. His confidence had waxed under the tutelage of the ancient race, particularly under the instruction of the Ageless One, the Prophet. Whether or not you see it, Father, I was right. Magni was right. This is my calling. The thought saddened him. He loved his father, but the gulf between Varian and Anduin, both in temperament and experience, was too great. Why can’t you see, Father? I’m not like you. And what’s wrong with that? Isn’t there something to be learned from our differences? From me? For his part, Anduin regretted their falling-out. His father insisted on treating him like a child, when the Prophet, Magni, and others clearly saw him differently, acknowledged his budding worth. Anduin and his father had argued during the Alliance summit at Darnassus, and Varian had laid hands on him, hurting his arm with a vice-like grip. The proudest moment of Anduin’s life had followed when, in the aftermath of that argument, the Prophet had spoken to him in his soft preternatural tones, inviting him to study at theExodaras his ward. Why couldn’t you see I had to go, Father? Why didn’t you see the honor in this invitation?